I've been asked about OpenCV with the Rift a few times, so I've made the example code for doing Rift rendering of captured OpenCV images the subject of my latest video. A walkthrough of an application that pulls images from a live Rift mounted webcam and renders them to the display. Love the idea with the skybox as background. Have to add it to my own application. Thanks for the pointer. I'll have to take a look at that, as I really only have a basic understanding of the way OpenCV represents lens distortion. If I can add it to my example I'll do so. On the other hand, I do kind of prefer the mesh based approach to correcting for distortion, since a shader based approach can push portions of the image off the geometry, or leave black borders at the edges, depending on the type of distortion. A mesh based distortion accounts for either case. This looks awesome! Can't wait to try this out, have a few small app ideas for video summarization using VR which would be based off this code! Can't wait to check it out later when(if) my DK2 arrives! This here looks very close what I intend to do: get 2 or more webcams, and either create a 3D picture or a wide FOV 2D picture. I did the Git download, did the cmake, found a project file, could open it with VS2012, and I can compile all libraries. But the examples I cannot. 1>c:\downloads\oculusvr\oculusriftinaction\examples\cpp\common\GlMesh.h(17): error C2473: 'color' : looks like a function definition, but there is no parameter list. when trying to build the Example_2_1_SDK. What (probably) noob error do I do? Or is Font.h and GlMesh.h broken? I might add: I usually program on Linux. Old style. With manually maintained Makefiles. I never programmed in Visual Studio before, but I could immediately compile the Rift examples. So I would not be surprised if I miss something really basic with Windows and/or Visual Studio here. In case anyone wonders why then I don't use Linux: it is because the Rift is connected to that Windows PC and I figured that the tool chain cannot be that bad and the programming itself will be very similar. The noob error was using Visual Studio 2012 which does not seem to know NAN (in Font.h) nor this new C++ construct (in GlMesh.h). No issues with Visual Studion 2013. Are there differences in camera quality performance wise? Are more expensive cameras "faster"? To battle the latency? Or is it only dependent on the resolution and the performance of your machine? 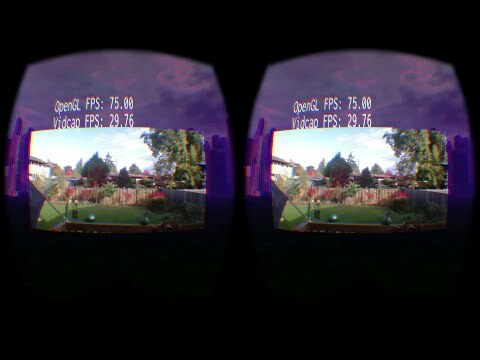 I am looking to implement similar code to render my mobile camera's live feed to the Oculus. The live feed from my cellular device can be accessed through a local server IP address. Your code simply accesses the 0th webcam in the system. How can I modify that to access a feed from a live IP address? Also, how can the output of this app be accessed? Ideally, for me, I'd like the output of this app to be transmitted back to a server. Thanks for the video! Have to add the concept in my own application. It may be a stupid question but you flip the texture with OpenCV on the CPU. Why do not just flip the OpenGL texture coordinates and let the fragment shader does "automatically" the flipping? It would be faster and reduce the camera latency. Am I wrong ? Hi Will you please tell me how you prepare setup for this demo "Oculus Rift In Action"
I have already cloned all git repository and created a build for that using cmake .. Thanks for the guide and a well written book (bought it last week). I'm new to Oculus programming as a whole, but for some reason I cant manage to get the FPS to show over the webcam-stream. I'm able to get everything else to run. Any suggestions? I am trying to run this webcam streaming application on my Oculus DK2. But since the development is done on the older version of Oculus SDK, the application is only running on the PC but NOT on the oculus itself. What could I be doing wrong? Note: I installed appropriate Oculus runtime (0.5 for this application) and included Oculus SDK (v0.4). I see that after installing Oculus runtime v0.5, the Oculus tracker is getting disabled and HMD stops responding. Is there something I missed? I guess technically the book is still valid if you have a DK1 or DK2 headset and use an sdk of 0.5 or below (the code examples were built against 0.5). But for CV1 owners and the current sdk, things are extremely different.